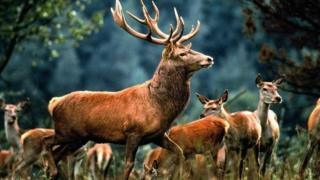 Deer are suffering due to illegal snaring in parts of Scotland, according to an animal welfare charity. The Scottish SPCA said it had been contacted with concerns that the practice was taking place in East Ayrshire, particularly in Auchinleck and Cumnock. Snaring and entrapment of deer remains an illegal act in Scotland. The animal welfare group has asked people to look out for snares and warned dog walkers to be vigilant. While the snaring of some animals is allowed, there are no circumstances in which it is legal to snare a deer and anyone suspected of doing so could be subject to criminal proceedings, the charity said. Chief superintendent Mike Flynn said: "Deer are very powerful animals and when made captive they become very distressed and panic in a bid to escape, often pulling so hard they cause serious injury to themselves, which in the majority of cases is fatal. "The sheer suffering involved is extremely concerning and deer snaring is an area of priority for our special investigations unit. "We have intelligence that this type of activity is prevalent in East Ayrshire and we are turning to members of the public for help." He added: "While snaring continues, suffering will continue, and that is why we are in favour of an outright ban."